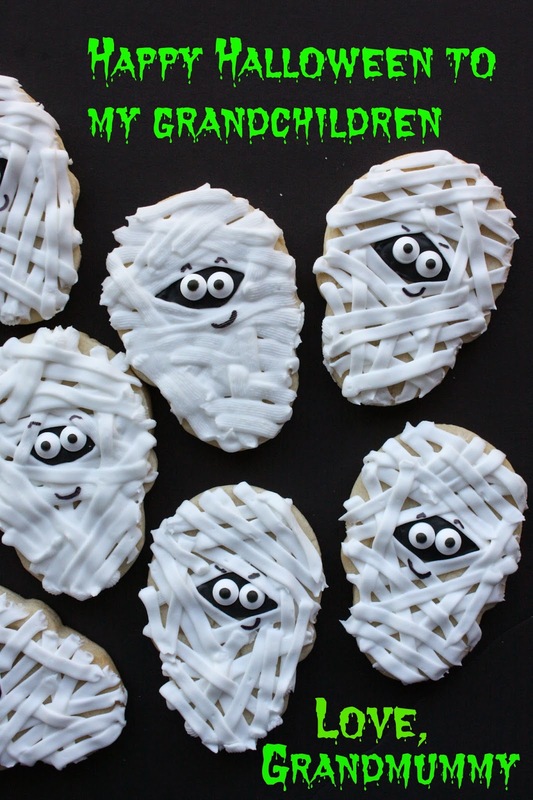 I cannot tell you how simple these mummy cookies were to make! I didn't have to outline or fill any cookies with royal icing in the traditional way, beyond the small black patch for the base of the eyes (The candy eyes were attached when the icing was wet). After I let the black dry for about 20 minutes I used some untinted (easy) royal icing, and with a #46 tip, traversed the mummy's head/face, in random directions, until there was good coverage. The cookies dried overnight (6-8 hours), and I then used a food marker for the facial details. That's all there was to it! Let's hear it for Simple and Cute!!! I hope my grandchildren like them as much as I do! These look so lively and fun! Thanks Angie! You too (even though it's almost over)! my grands would adore these! Thanks for visiting and commenting, Susan! what cute and Beautiful decorated cookies. Thanks for your comment, Colleen! This is my kind of cookie. I think even I could make these. They are adorable. I bet you are the most fun grandma on the block! These are so cute! I love the little eyebrows and mouths. Too fun! Love these cute little guys..even better, I love how simple they are to make! Yummy mummies!